Fall is here, and though I bemoan the loss of the vibrant green plant life in the forest and the city, I also enjoy the fall as the time of year for preparing my wintertime medicines. 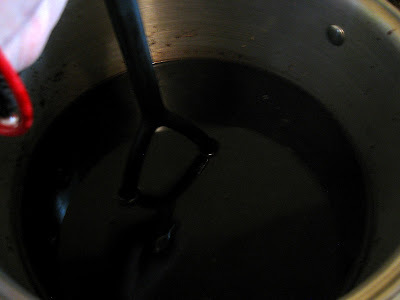 One of my favorites is elderberry syrup. Elderberry syrup is very easy to make and tastes delicious. First we'll look at its benefits, then at a recipe you can use to make your own. Elder belongs to the Caprifoliaceae (Honeysuckle) family of plants, and there are over 30 species globally. Common species are Sambucus nigra, an old world native and Sambucus canadensis, which is indigenous to North & Central America. My local elder is Sambucus mexicana, or Mexican Elder, which matures at between 15- 35 feet in height, given enough rain and mild winters temperatures. Sadly, we've had two rough winters (by desert standards), and two years of drought, which has taken a toll on our local elder trees. Early European peasants and Native Americans used and revered elder, and it's still a widely used herbal medicine. Rightly so, as the plant is a trove of medicine. The flowers, leaves and berries are the parts used. In this post, we'll be looking at the medicinal properties of the berry. Note: When using elder medicinally, use only the varieties that produce the blue and black berries. Species that produce red berries (like Sambucus racemosa and S. pubens) are potentially toxic. It's also important to only eat elderberries that have been cooked first, as they cause digestive upset when consumed in raw form. The raw seeds are potentially toxic as well. 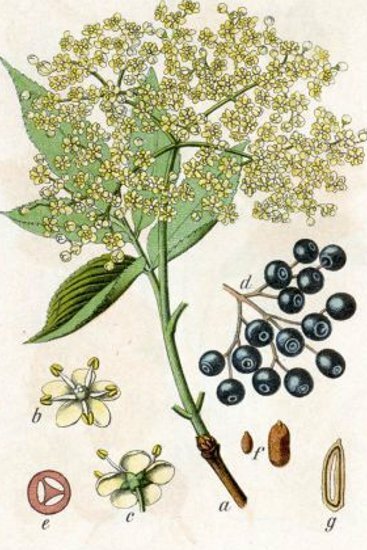 Elderberry is first and foremost known as a superb herb for preventing and treating colds, flu and coughs. It has been used for this purpose for thousands of years. It is also great for sore throats and inflammation of the upper respiratory tract. Elderberry is an excellent antiviral, having a particular affinity for inhibiting the viruses that are responsible for the common cold and influenza. How does it do this? These viruses have surface "spikes" called hemagglutinins, that the viruses use to attach to and infect healthy cells. These viral "spikes" are also coated in an enzyme called neuraminidase, which helps the virus penetrate the membrane of the healthy cell. It's thought that elderberry works by both disarming both the "spikes" and the enzyme. Modern research has confirmed that elderberry is effective against many different strains of influenza, and has been proven to shorten the duration of this illness. Elderberries contain beta-carotene, B vitamins, vitamin C, potassium, and flavonoids (like rutin and anthocyanins). They are also high in iron, and were once used in the treatment of anemia. *Note- I usually make larger batches because I like to give some to friends and family. 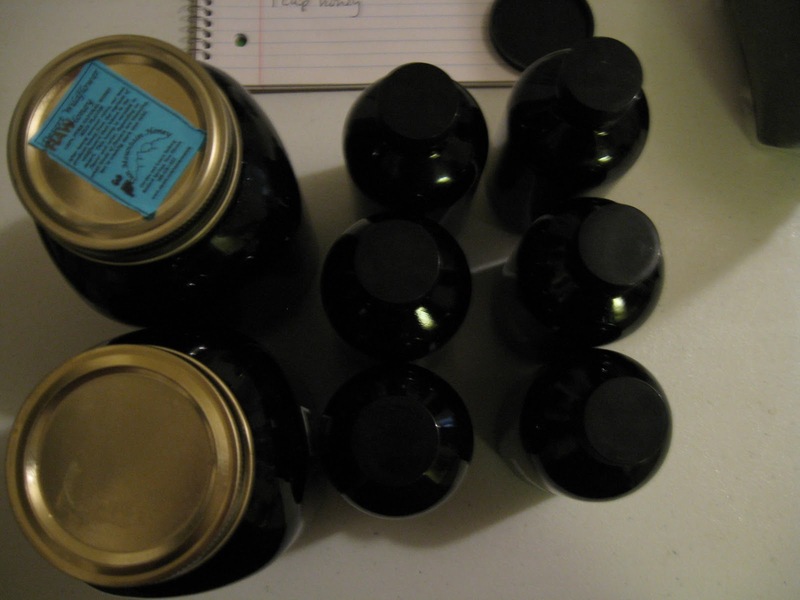 In the photos below, I quadrupled the recipe, which yielded approximately 116 ounces of syrup. 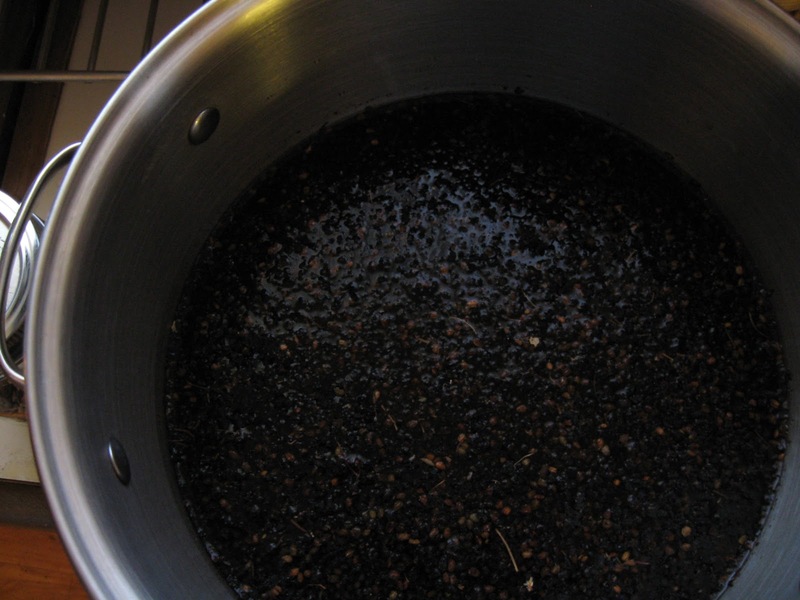 1) Put the elderberries and the water in a pot or saucepan. Cover and bring to a boil, then reduce heat and simmer for 30-45 minutes. 2) Remove from heat. Mash the berries. A potato masher works well for this. 3) After the mixture has cooled enough to handle comfortably, strain the mixture. I line a wire mesh strainer with a few layers of cheesecloth and place it over a large bowl. Be sure that your straining system is fine enough to strain the seeds from the liquid. You do not want them in your syrup. After I've poured the syrup through the strainer into the bowl, all the the elderberries are resting on the cheesecloth, which can be picked up and given a good squeeze to extract more out of the elderberries. Compost the elderberries when done. 4) Add the honey to the syrup, stirring until dissolved. 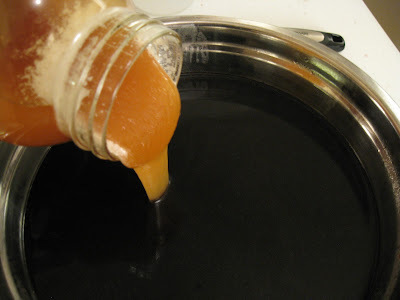 5) Pour your syrup into jars or bottles. Be sure to label it and date it. 6) Refrigerate the syrup. It will keep for 2-3 months. To use: Take 1 teaspoon to 1 tablespoon twice daily as needed. 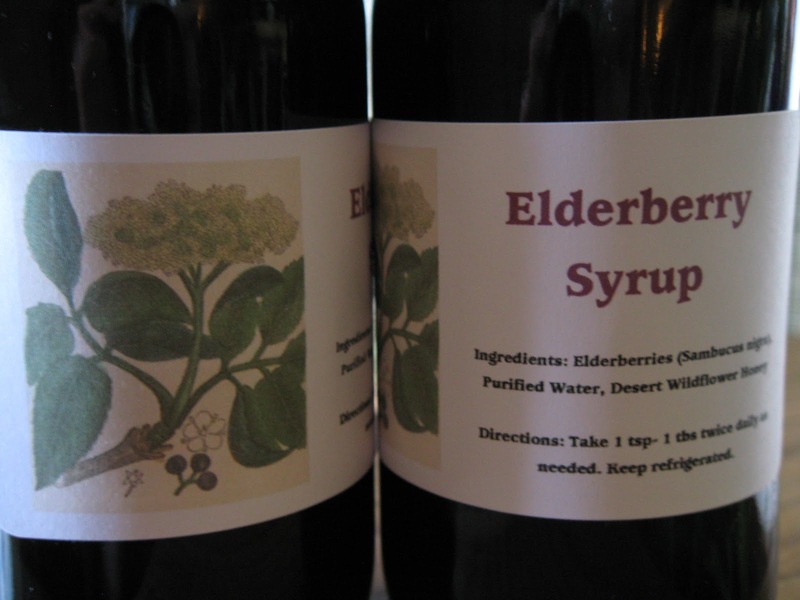 Elderberry syrup can be taken as preventive medicine throughout the cold and flu season, as well as during these illnesses. Some folks like elderberry syrup on ice cream, pancakes or other desserts. Cech, Richo. Making Plant Medicine. Williams: Horizon Herbs, 2000. Gladstar, Rosemary. Herbal Recipes For Vibrant Health. North Adams: Storey, 2008. Hoffmann, David. Medical Herbalism. Rochester: Healing Arts Press, 2003. Skenderi, Gazmend. Herbal Vade Mecum. Rutherford: Herbacy Press, 2009.